Have some outdoor fun, and go play this exciting sport! Hole - Each individual playing field, as part of the 9 or 18 playing fields which are played to conclude a “round” – or a game. Course - Refers to the venue of the collection of disc golf holes. Drive - The initial “shot” – or throw – on each hole. Intended to be a player’s farthest throw on each hole. For scoring purposes, the drive is considered shot #1. Tee Box - The designated area where each player must “drive” from. Cup - The target you are shooting toward on each hole. Making the disc in the cup marks the conclusion of each hole of disc golf. A hole is played until each player has made their disc in the cup. Par -The average amount of throws it should take for a player to get their disc in the cup. This number is posted at the tee box at the beginning of each hole. The terms “Albatross” and “Condor” are used for players making the disc in the cup three and four shots below average, respectively, but are very rare. Driver - Disc used to make the initial throw on each hole. Known for its ability to fly long-distance. Iron - Discs used to make midrange throws toward each hole. Known for their ability to fly/roll mid-distance. Putter - Disc used to make the final throw(s) on each hole. Known for its ability to glide accurately for short-distance. Just like in standard golf, the object of the game of disc golf is to make the disc in the cup – which in disc golf is a chain-linked, basket-like object – using the fewest shots possible. Similar to standard golf clubs, there are numerous disc options and gameplay strategies that can be utilized to make every shot your best. Whether it be drivers, irons or putters, discs are made in a variety of weights and shapes to assist the style of play for each player. Interestingly, some discs are even shaped to be thrown certain ways, such as the Valkyrie, which is designed to be thrown for distance and glide against tailwinds – so be selective with the discs you purchase, and in what situations they’re used! Just like with baseball pitchers, the throwing styles that work best for each player is entirely customized to their person. The most common disc throwing style is the traditional Frisbee toss – holding the disc face-up, curling the palm and fingers around the disc’s edge, and throwing it across the body backhanded (throwing from the inside of your body outward). Other common styles include the sidearm/forehand throw – tossing the Frisbee using the same technique as traditional, but instead throwing it across the body from a backhanded position (throwing from the inside of your body outward), and the Tomahawk – gripping the disc between the thumb and fingers, beginning the throw over the head, and motioning the arm downward to release (similar to a baseball pitching technique). Tutorials of these techniques and advice on which disc types work best for each throwing style can be found online. Unique to SIUE, there is a disc golf course in our backyard – right here on campus! 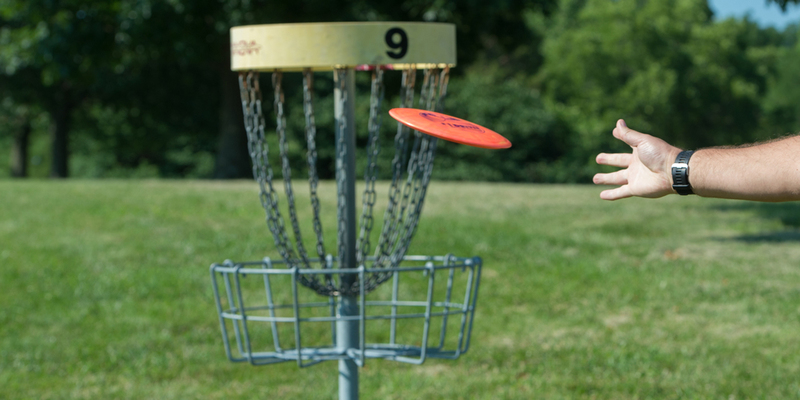 The SIUE Disc Golf Course is a 9-hole course open to the public, free of charge. Located south of Prairie Hall, the first tee box of the course can be found near the residence hall’s sand volleyball court. Players may use their own discs, or borrow them at either the front desk of Prairie Hall or the Equipment Issue counter in the Student Fitness Center. The average time needed to complete a game is situational, based upon number of players and the skillset of each player. As a general suggestion, groups of five players or less are convenient to competition and the pace of play. In a group of this size, a 9-hole course should take approximately one hour to an hour and a half – a perfect length of time to take a study break! If anyone is ever up for some friendly competition, I am more than willing to take on the challenge – let’s play! Now go ask a few friends to have some outdoor fun, and go play this exciting sport. Get more information from Prairie Hall, Equipment Issue and Campus Rec to play today!